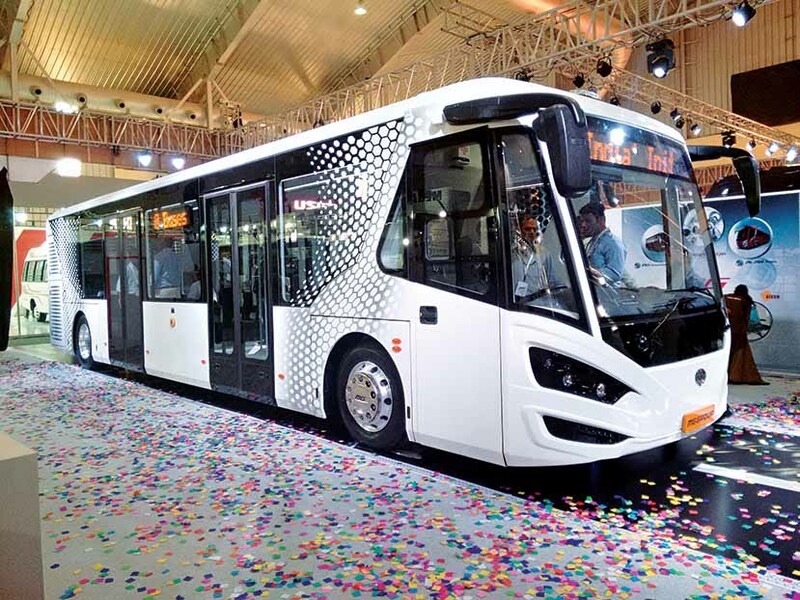 Held at Bangalore, the seventh edition of Busworld India saw the bus industry come together and showcase its strength. 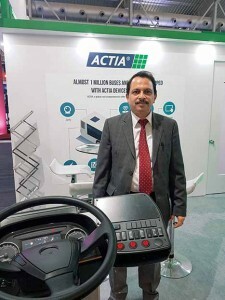 The seventh edition of Busworld India 2016 opened its gates to visitors in the morning of November 10, 2016, at Bangalore’s International Exhibition Center. The fair was organised by Kortrijk-based Busworld International, and supported by ASRTU, ARAI, IRU, ICAT and BOCI. Inaugurated by Bart De Groof, Consul General of Belgium in the presence of Oleg Kamberski, Head – President Transport, IRU, Didier Ramoudt, President, Busworld International, Rajender Kumar Kataria, Managing Director, KSRTC, and Vice President ASRTU, Prasanna Patwardhan, Chairman and Managing Director, Prasanna Purple, and President BOCI, Hakan Agnevall, President, Volvo Bus Corporation, Jan Deman, Busworld Academy, and Rajan Sharma, Managing Director, Inter Ads Exhibitions Pvt. 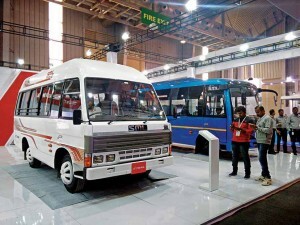 Ltd., the fair saw the showcasing of some of the most interesting buses available in India. Right at the front were parked two Alma Mammoth buses. Painted in an attractive shade of yellow and red, they marked the India launch of these buses. Of particular interest was the yellow bus, a sleeper coach derivative of the Mammoth. 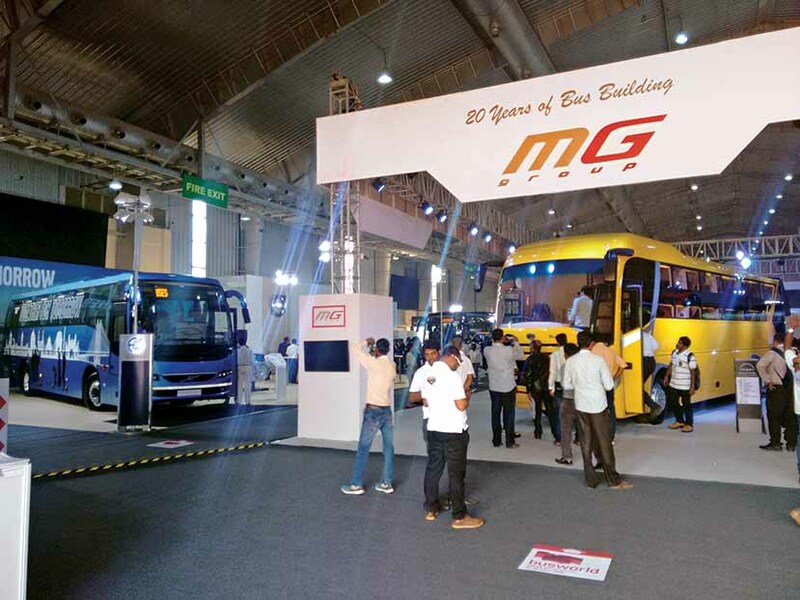 Built on a MAN front-engine (power bumped to 280 hp) bus platform, the Mammoth marks the flagship offering in the inter-city bus space of the Mumbai-based MG Group. Expressed Anil Kamat, Managing Director, MG Group, “We will be launching the Mammoth in the domestic market in seater and sleeper variants. With it, we are set to transform the bus building industry in India.” The Mammoth is expected to cost in the range of Rs.60 to Rs.65 lakh. In what could be termed as the highlight of the fair, the MG Group also unveiled a tarmac coach. 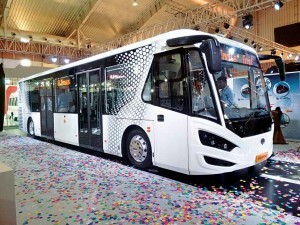 Unveiled by R V Deshpande, Minister for Large and Medium Scale Industries, Infrastructure Development, Government of Karnataka, the bus, called the Columbus, is a monocoque ultra-low and flat-floor design. With a passenger entry floor height of as low as 290 mm (after kneeling), the Columbus seats 8 people, and can accommodate 67 people. It is powered by a 230 hp Cummins engine, and features a smartly designed interior. Offering swift passenger entry and exit with five passenger doors (three on the left, and two on the right side), the Columbus is equipped with a six-speed ZF auto transmission. Featuring a double drop front axle, the Columbus has a fully composite and leak-proof roof panel. Lighting is LED intensive. Incorporating technologies like ECAS, ABS, and CANBus, the Columbus tarmac bus meets the Airport Handling Manual regulations. SML Isuzu displayed two new buses, a 20-seater Executive Ex Coach based on a longer, 4240 mm wheelbase. The other bus, the Ecomax, is built on a smaller, 2815 mm wheelbase, and can seat 13 people. It can be had with an air conditioner and individual mobile charging points. Daimler India Commercial Vehicles displayed a BharatBenz staff and school bus. While industry sources claim that Wrightbus has pulled out of the Indian venture, the two buses (school and staff) made for a pretty site. Either bus is powered by a 140 hp, 3.9-litre four-cylinder common-rail turbodiesel BSIV engine. 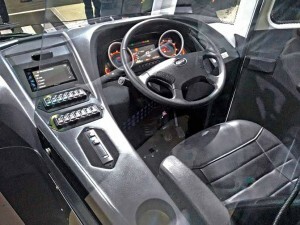 Transmission is a 6-speed manual unit, and the bus features ABS and tilt adjustable steering. Capable of seating 49 people (with 3×2 seat configuration) and 26 people with push back 2×1 type seats, the BharatBenz buses are said to be based on the Fuso Fighter platform. 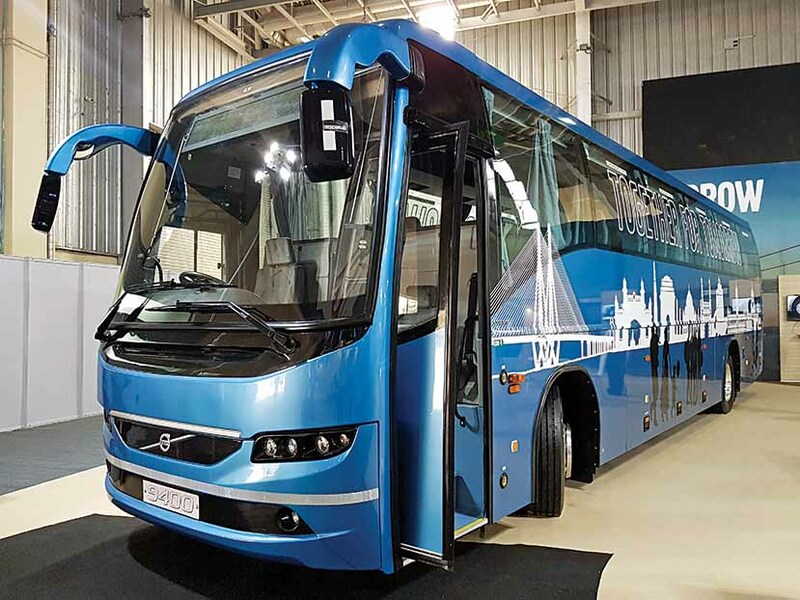 The suspension of the buses is made up of parabolic leaf springs, double-acting telescopic shock absorbers and anti-roll bars with stabilisers. Bus ancillary manufacturers were out in good force at the fair. 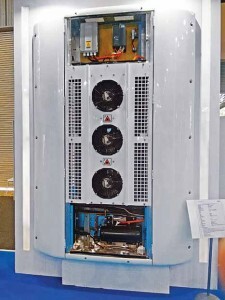 At the forefront were the bus AC manufacturers. Expressed K P Singh, Director-India Region, Eberspaecher Suetrak India, that they are experiencing good growth. “Our production has risen from 3000 units to 5000 units,” he said. 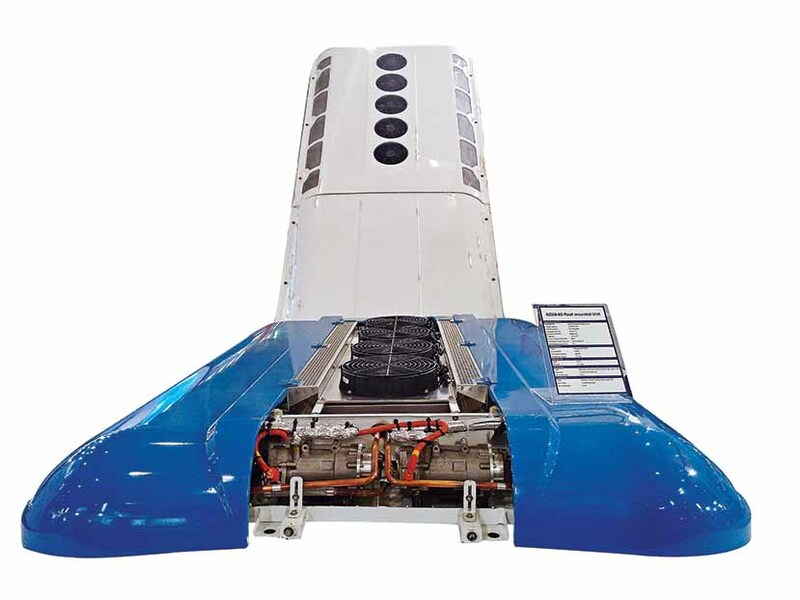 Displaying bus air conditioning systems, Sphere Thermal Systems Private Limited showcased an (electrical) air conditioner for hybrid and electric buses. The company, said Pramod Verma, Vice President, specialises in central air conditioning, transport air conditioning and refrigeration products. 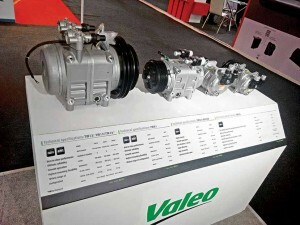 Indulging in the insulation bit of reefer trucks, Sphere, according to Verma, offers bus ACs in the 5kW to 50 kW range. Having a technical tie-up with Guchen, China, the company has grown 400 per cent since inception in 2011 according to Verma. The market for bus ACs, he avers, is between 20,000 and 25,000 units as compared to 12,000 and 14,000 units five years ago. Mentioned Verma, that market penetration of bus ACs is still at 20 to 25 per cent, and there is big potential for growth. The areas for growth, he outlined, include staff buses, school buses and tourist buses. STUs, said Verma, are bulk buyers. Their AC buses are helping them to earn good revenue, he added. 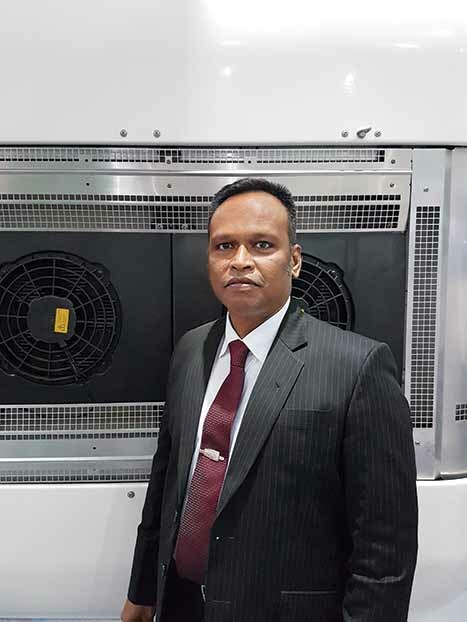 Shatrughan Kumar, Director, Trans ACNR, expressed that it is easy to build an AC due to easy availability of parts, the challenge lies in providing the right support. He drew attention to a service app. his company has launched. Referring to south India as a strong AC bus market, Kumar announced that they command 90 per cent of the AC bus market in Kerala. Regarding growth, Kumar said that they have already fitted 5500 ACs as compared to 3200 ACs last year. He stressed upon addressing customer needs. 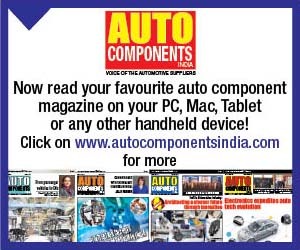 Trans ACNR, said Kumar, is offering its customers AMCs tailored to meet their needs. This, he quipped, saves the operator from unexpected expenses and sudden surprises. Spheros Motherson displayed its range of bus ACs, including the unit it offers for hybrid and electric buses. According to Cyril Xavier, COO, Spheros Motherson Thermal Systems Ltd., “Sheer performance and reliability is what we are banking upon.” “We have a product for the premium, and for the aftermarket.” Pointing at the new CC355 bus AC, which will replace the CC350, Xavier avers, “No one’s stronger than the other in the bus business. One stop solution is being demanded by operators, and is driving a market for fully-built buses. 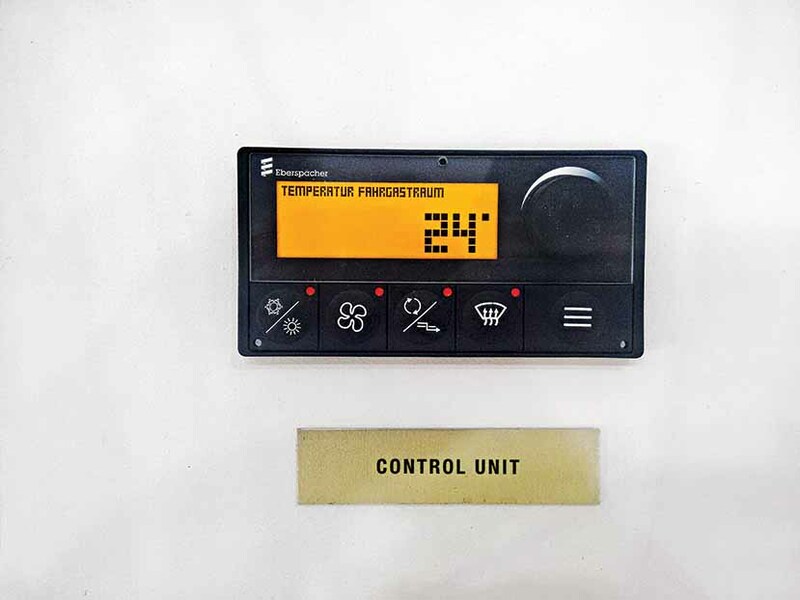 Demand for midi- and larger bus ACs is growing.” The Revo ACs Spheros Motherson offers is born out of the need to address energy efficiency needs of premium bus manufacturers. Claimed Xavier that their Revo E has been fitted to the Tata Starbus Hybrid bus. 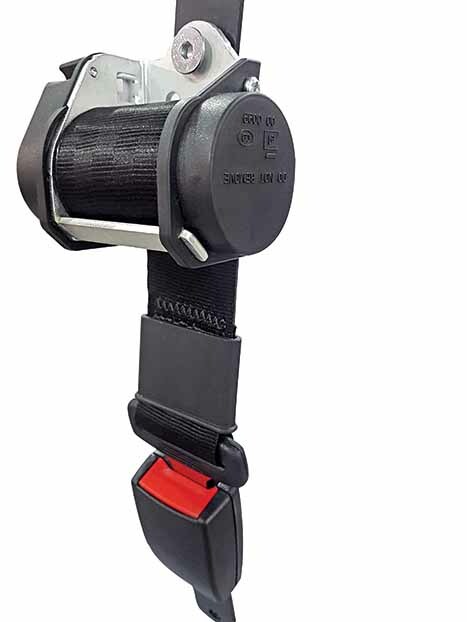 Austrain company, Fasching Salzburg Gmbh displayed a wide range of seat belt systems for buses. The sales director and authorised officer of the company, Harald Pebl Ing, expressed, “Safety initiative should be inculcated in India. Awareness has to be infused in the culture.” Seat belts, he mentioned, are not new for the Indian market. Drawing attention to the regulatory norms being slated for November 2017, Pebl averred that seat belts will get its regulatory ordinance. He stressed upon fitting inter-city buses with seat belts. 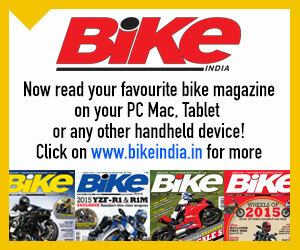 “We want to tap the Indian market with our core strength,” he added. 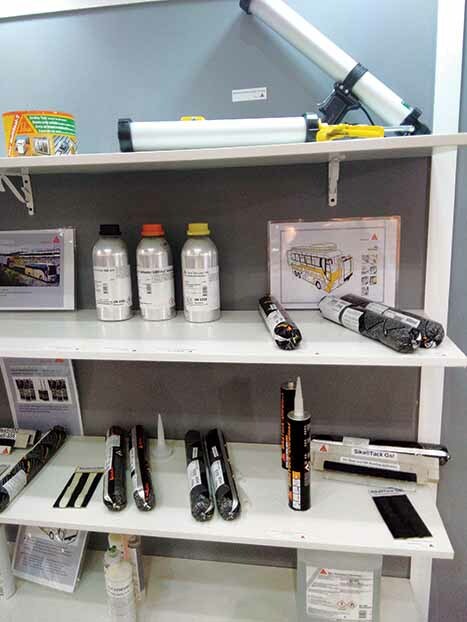 Sika India displayed the range of bonding solutions it offers to the bus industry. 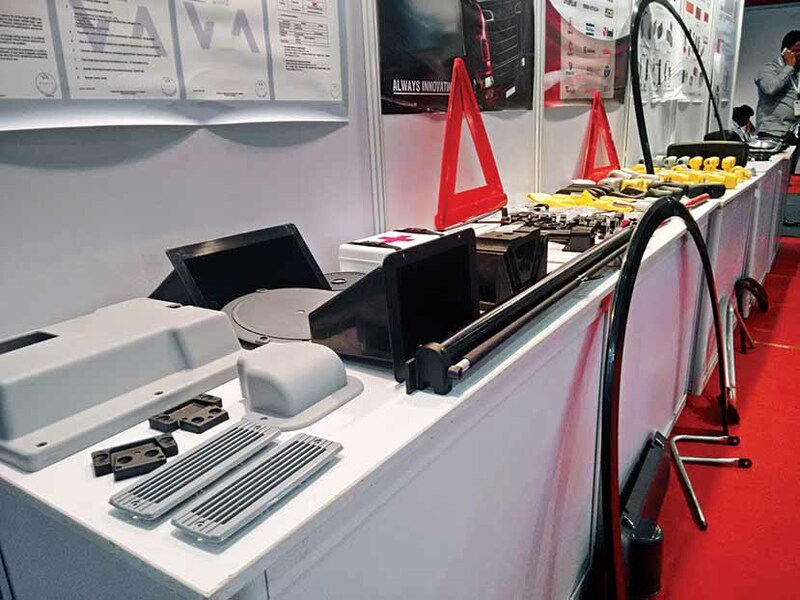 These include polyurethane, polyurethane hybrid, epoxy hybrid, hotmelt adhesive and reactive, and laminating adhesive technology solutions. Catering to clients like Tata Marcopolo, Ashok Leyland and Scania, Belgaum-based RG Fibrotech displayed bus front and rear fascia. 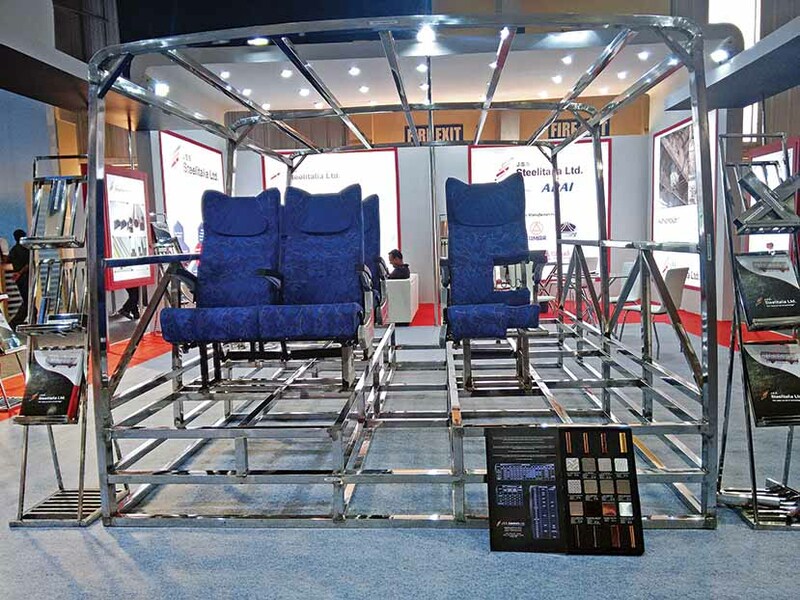 Bangalore-based Mecolam Engineering displayed fibreglass products like fascias, dashboards, engine covers, etc., that it offers to the bus industry. 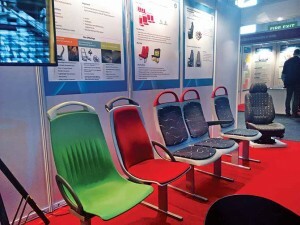 Lamilux (India) highlighted its composite solutions for buses. Said Cosima-Klinger Paul, Managing Director, Lamilux India Private Ltd., that weight is the criteria that Lamilux is pushing in the bus industry with FRP products. “Mahindra is contemplating the use of our FRP products in the bus that they are developing,” she added. 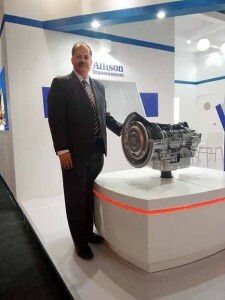 Lamilux is catering to the needs of ACGL and JBM in India. Valeo displayed its range of compressors for bus air conditioners whereas Doga India put up an attractive display of its wiper systems. The company will begin manufacturing these early next year. 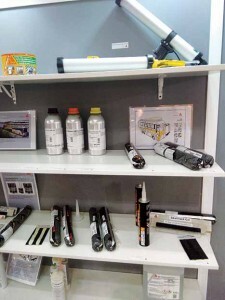 Apart from windshield wiper and washer systems, the company specialises in window lift systems, geared and non-geared motors, gas springs, tank systems, and electrofans, blower and air ducts. 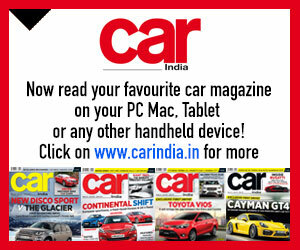 Hyderabad-based Smartdrive showcased alcohol detection solutions like breath analysers. J.S.S Steelitalia Ltd. displayed an exposed tubular section of the bus body. 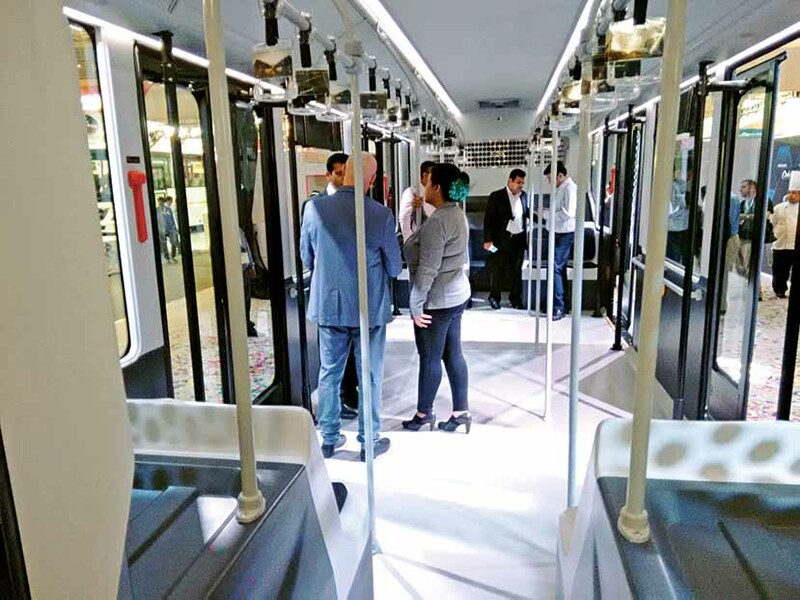 The company is promoting the use of stainless steel tubes for bus body construction in the interest of safety, reliability, lower operating cost and better fuel economy. 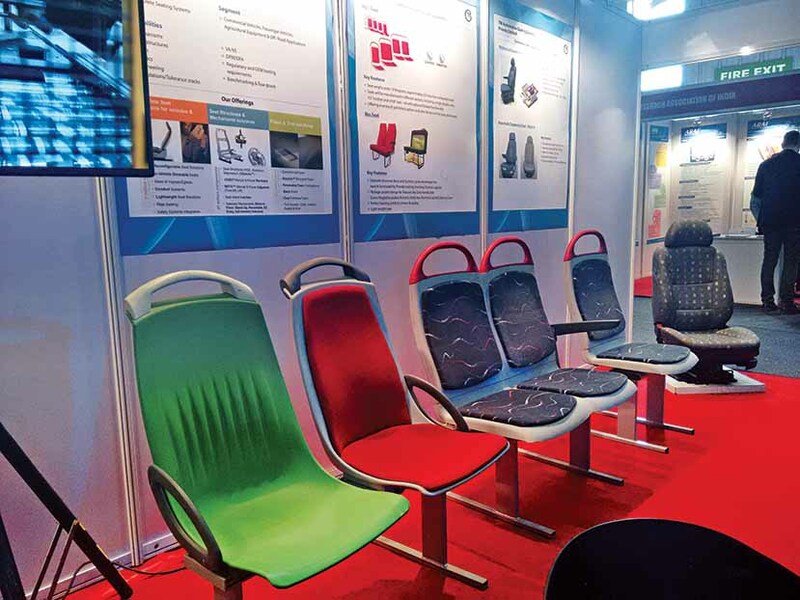 Specialising in transportation décor, Niemla put on display fabrics that find use in bus seating systems. 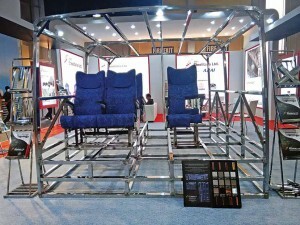 Putting up an attractive bus seating system display were Pinnacle Industries. Specialising in the cutomisation of Force Travellers, PKN (Prime Engitech Pvt. Ltd.), displayed some very interesting trim parts and an air conditioner. Catering to almost all the bus makers and bus body builders, Pacoline Industries, displayed mirror assemblies, interior lights, reflectors, warning triangles, steering wheels, spray suppression flaps and other plastic components that find use in the construction of a bus. Singing the ‘Made in India’ note, the Busworld India 2016 saw the participation of 77 exhibitors. 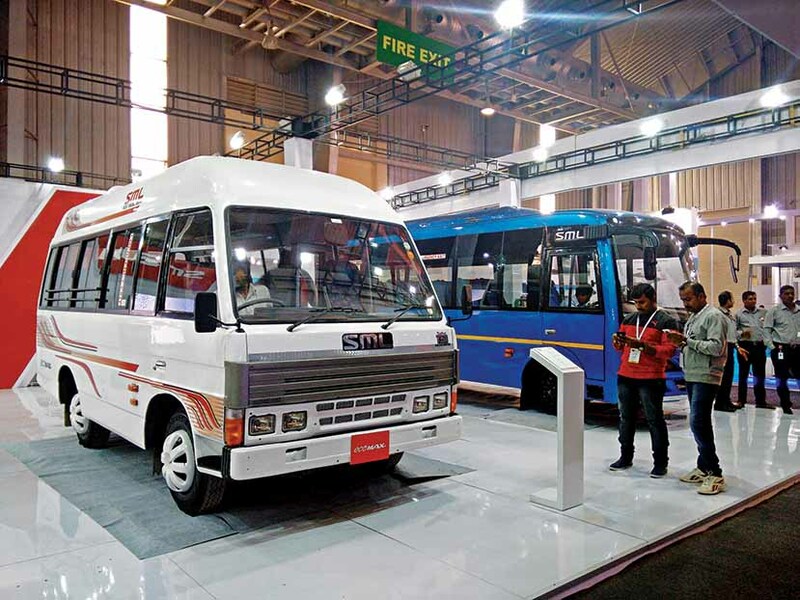 With a good mix of domestic and international players, the absence of key bus manufacturers, Ashok Leyland and Tata Motors, failed to dampen the spirit of the show. 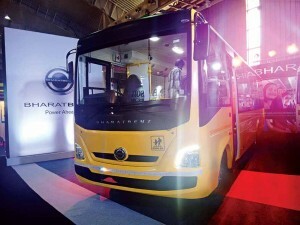 Some very exciting buses from Daimler India, SML Isuzu, Volvo Buses India, and the MG Group were the high point. 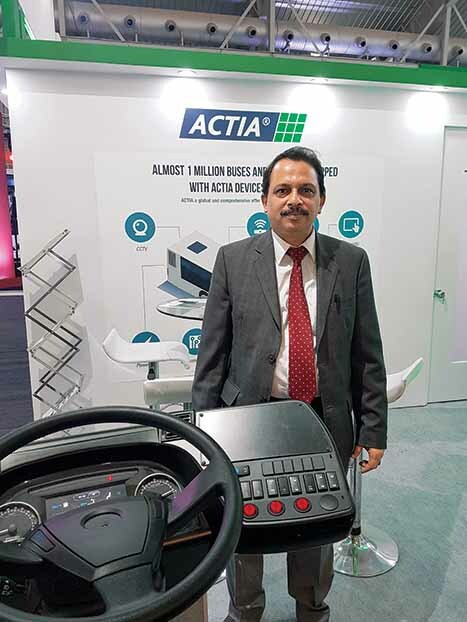 In what felt like a slightly subdued affair when compared to the last edition held at Mumbai in 2015, Busworld India 2016 was successful in bringing the bus industry together. 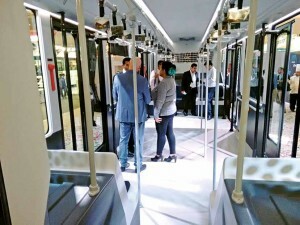 It were perhaps the sudden demonetisation announcement by prime minister Narendra Modi on the evening of November 8, 2019, that weighed on the minds of visitors. Footfall felt like it was affected. Good connectivity to the exhibition venue was lacking. Can you tell me how to clean RV ac system in MG bus ? What should be cleaning intervals for same? The recommended time is six months depending upon usage and region on a case to case basis. Request you to kindly share with us your name, profession and region from where you operate for us to further guide you better. 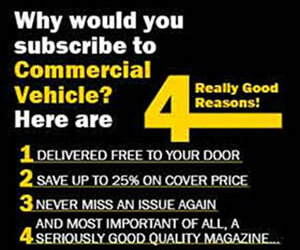 We suggest you look at visiting an authorised dealership for aftersales needs and get the best out of your vehicle. 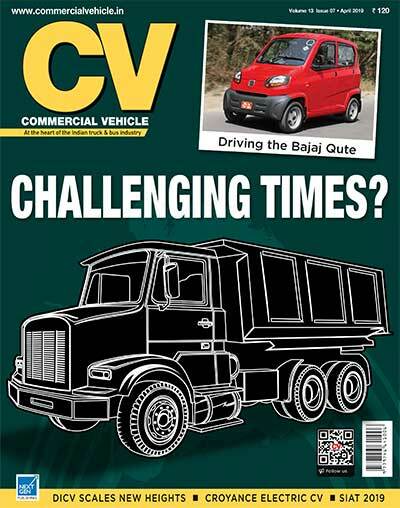 Thank you for connecting with CV. Look forward to more interactions.